He has built a new kiln of his own design and making ( which may be why it took so long ) and is now turning out really lovely SODA-GLAZED pots. He's still not satisfied and continues to experiment and to advance his technique in his search for new colours and textures , and the shapes are evolving as well. 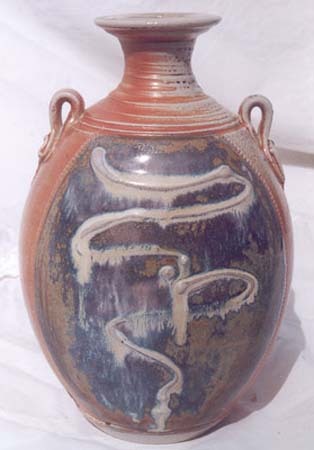 Barry Huggett’s pottery today is the result of a steady evolution from his days as head potter at the old Lake’s Pottery in Truro . 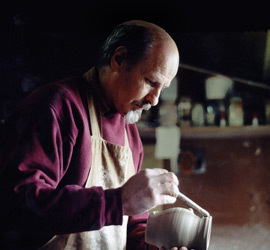 Seminal influences have been John Davidson of Ladock and now , Hugh West, late of of the Carnon Downs Pottery , whose workshop Barry shared . After Salt Glazing for 10 years and moving into a new workshop. I decided to change direction and experiment with Soda Glazing as it gives brighter but subtle colours and texture. 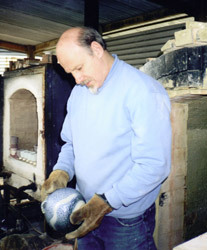 I once fire my pots to 1300 degrees C. with the soda being introduced when the kiln temperature has reached 1250 degrees. I continue to spray for two hours until I have used 2 kilos of Bicarbonate of Soda , which has been dissolved into hot water to form a saturated solution.By withdrawing a test ring from the kiln at intervals I can check the soda build up on the pots. 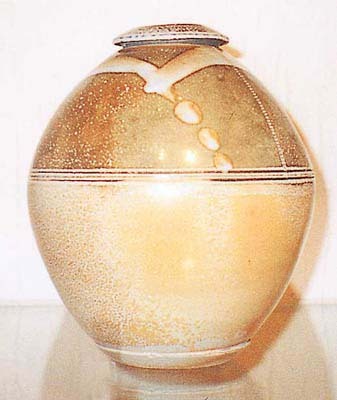 The soda solution forms a glaze by combining with the silica and alumina inherent in the clay to form the classic orange peel of the traditional salt glaze. As the soda builds vapour doesn't flow as readily through the kiln as salt vapour, the pots have a tendency for an uneven soda glaze effect texture. Salt glazing originated in Germany’s Rhine land in the 12th cent. Salt is placed in the fire boxes of the kiln where it volatilises and drifts through the kiln as a vapour combining with the silica and alumina inherent in the clay to create the classic “ Orange Peel “ salt glaze .